omid (mashhad, Iran) on 9 April 2017 in Animal & Insect and Portfolio. Fine observation and a magnificent background. I like the way the silhouettes of the birds are suggested in the puffs of cloud ... nice. Beautiful silhouettes and mood ! Wow! This is such an amazing shot! I just love the colour of the blue and silhouettes. :...:. :::: also !!! Excellent !! Que pases un maravilloso domingo. Beautiful play of silhouettes, perfect on this background. wow !! What a fabulous shot here Omid !!!!! I simply love this ! These silhouettes look like blossoms on the tree! Superb framing too! Quels oiseaux et découpage dans les bracnhes fantastique vue. Superb ! Great atmosphere ! Amazing picture with the gathering of lovely birds! Not so scary as in Hitchcock's film! Thought of the old movie "The Birds". A fabulous image! 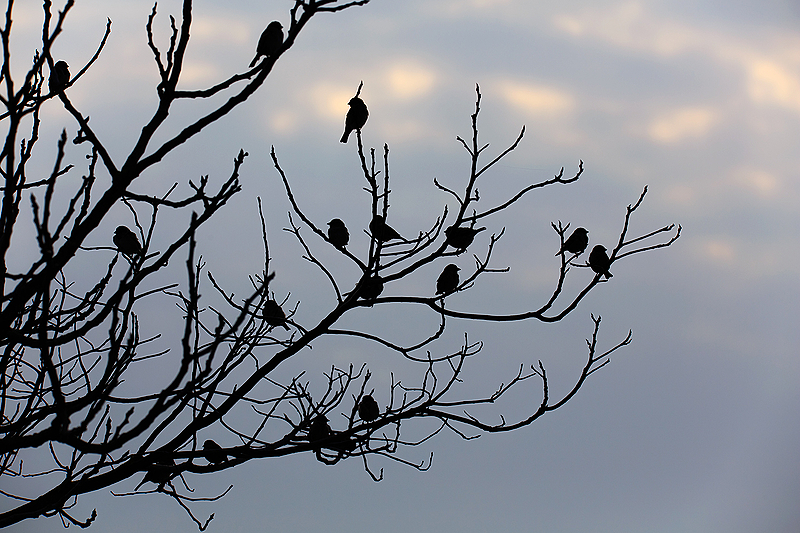 Wonderful silhouettes of all these birds! That makes a nice silhouette shot. A very fine study - a tick in every box, as always ! Lovely scene, birds ready to go to sleep. An example of neighbors who get along.